You are here: Home > News > Waterside Station Approval: UAH requests ‘Call In’. The very disappointing decision by Derry and Strabane District Council planning committee to approve Translink’s application for the Waterside and to grant Listed Building Consent to a scheme described in the meeting as ‘not a heritage project’ leaves UAH with no alternative other than to request a ‘Call In’ of the applications. Failure of applicant and sponsor Department to respond to, or to acknowledge, Freedom of Information requests. 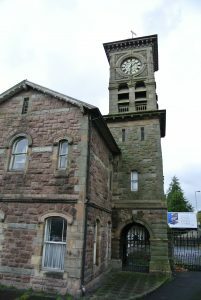 The listed 1873 John Lanyon Waterside Station is described in the Department for Communities Listing Register as: ‘tower and railway terminal form an elegant and dignified composition on the prominent East bank of the River Foyle and provide one of the finest examples of railway architecture in Northern Ireland’ . The Station is now the only surviving Victorian era Terminus Station in state ownership/care in NI, and as such is unique. In its riverfront setting at the Derry end of an internationally renowned scenic rail journey it should be realising its potential as an exceptional heritage tourism destination in its own right, celebrating railway architecture and Derry’s industrial heritage, while fulfilling modern active travel requirements. The Terminus and its riverside setting came before Derry and Strabane District Council planning committee on the 11th April 2018. The applicant was the Department for Infrastructure sponsored Translink, who are proposing to build a ‘Multi Modal Transport Hub’ incorporating the Lanyon terminus. Despite successfully achieving a broad heritage consensus for Waterside, following many years of detailed work by UAH, the Derry groups ‘Into the West’ and Foyle Civic Trust, and support from two very well informed SDLP Councillors, clearly passionate about the built heritage and future prosperity of their City, the Council voted 9 votes to 2 in favour of the Translink proposal. 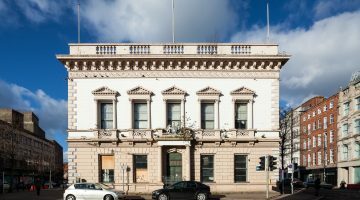 How then did a unique Heritage Tourism Asset, in state ownership/care, and of Regional importance to the Northern Ireland tourism product, to the City of Derry’s offer as NI’s lead Heritage City, and to Translink, as a means of increasing Railway Tourism footfall, fail to meet ‘Safeguarding Tourism Assets’ policy criteria? Simply because the Translink/DfI design brief managed to turn the exceptional into the ordinary and the unique into the mundane and the ‘Emperor’s Clothes’ Public Relations campaign mounted by Translink appeared successful in swaying decision makers towards approval. The Council decision mimics 1970’s and 80’s dreadful Departmental planning approvals for Derry which opted for debasing the City’s famed ‘Quays’ with car parking and the service side of retail stores, on the apparent abiding NI principle of, all investment is good investment, regardless of quality. NI often favours investment over standards, without consideration of the actual (or absence) of impact of such investments, on our people, towns and cities. As a result actual opportunities for Northern Ireland, like Waterside’s heritage and tourism potential, continue to be missed or destroyed. The circumstances which have resulted in the Waterside approval represent a stark testament to the continued absence of application of policy, priority, vision and coordination across government departments in Northern Ireland relating to our irreplaceable Built Heritage Asset. If a government owned building of this importance can be approved as suitable for such an unimaginative and sterile proposal by Translink, a Government Company sponsored by one Government Department and signed off as meeting Heritage policy by yet another Government Department and then endorsed by Tourism NI, despite being degraded to the status of ‘not a tourism asset’ it is clear that Northern Ireland’s Built Heritage is in very deep trouble indeed.